Are you conscious of "interpreting" the Bible, or do you believe you are simply "reading what is there"? Do different translations and approaches affect what we hear Scripture saying? How should we approach the Bible to use Scripture in our own lives? A "user-friendly" version of the Panel on Doctrine's Report on the Interpretation of Scripture, this workbook offers a helpful way of exploring, using and "interpreting" Scripture in daily life. Its approaches to reading and studying Scripture allow the Bible to speak powerfully with its own voice. 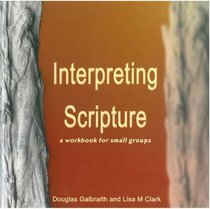 About "Interpreting Scripture: A Workbook For Small Groups"
The Rev Dr Douglas Galbraith uses his great wealth of experience and knowledge to pull together all of the key information about the Church. He is ably assisted by Ivor Normand, an experienced Production Editor who has worked on many aspects of the Year Book for the past 13 years. Together, their work produces an invaluable resource for the life of the Church.